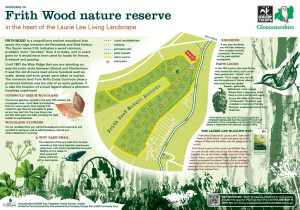 Work done for the Gloucestershire Wildlife Trust redesigning a new Leaflet/map to guide you around a beautiful 6 mile walk through the Slad Valley that has been renamed the ‘Laurie Lee Wildlife Way’. This walk explores one of England’s most beautiful valleys, immortalised in the works of local author, Laurie Lee. 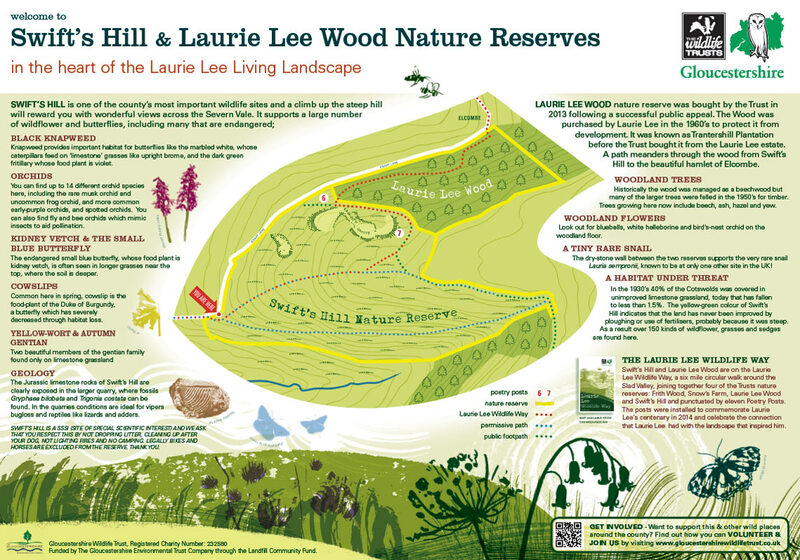 The trail links four Gloucestershire Wildlife Trust nature reserves, and is punctuated with ten posts, inscribed with Laurie Lee’s poetry. The walk begins and ends at Bulls Cross on the B4070 where there is a layby to park in. Grid Reference SO 877 087. 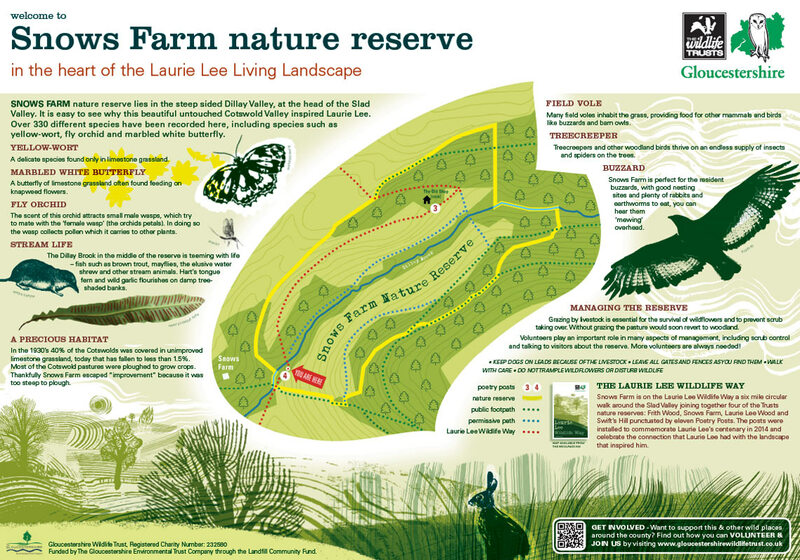 Laurie Lee spent his childhood in the Slad Valley, the setting for his autobiographical novel Cider with Rosie. The landscape that inspired his work remains largely intact, as does his childhood home, the church, school and the Woolpack Inn. 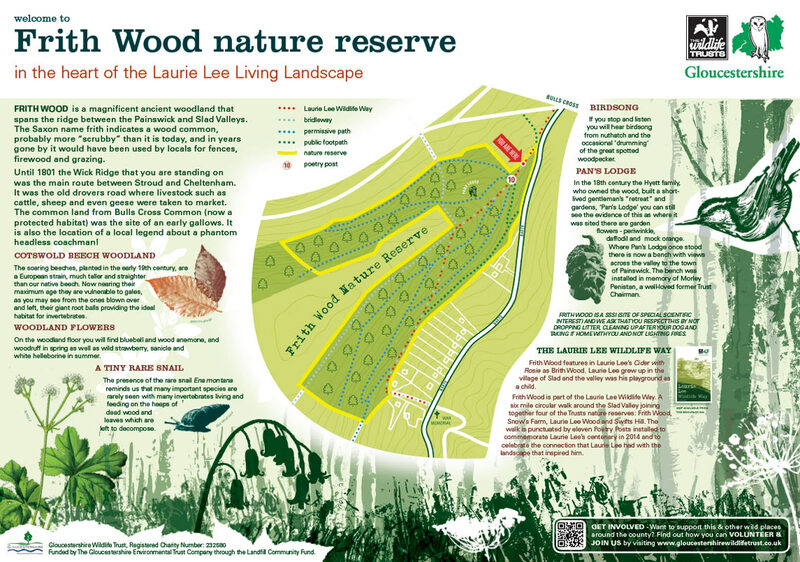 There are 10 poetry posts that have been erected in and around the Slad Valley and one at the Museum in the Park, Stroud, inscribed with Laurie Lee’s poetry. The posts celebrate the connection between the work of Gloucestershire’s most famous 20th century writer and the landscape of the Slad Valley that inspired him. 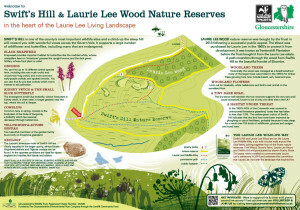 I have also redesigned 3 A1 interpretation boards that are to be situated in 3 of The Trusts Nature reserves within the Valley. It has been an exciting and rewarding brief to work on as the Slad Valley has become close to my heart since arriving in the area, not least because a favourite ‘Great Uncle’, Carey Carey-Smith grew up in Slad in the 1920’s/30’s and would have, as a child, roamed free throughout the valley.